Three robbery suspects, who said they were returning from a vigil, but could not explain how they got in their possession two goats, properties of a restaurant owner, have been arrested in Amarata, a suburb of Yenagoa, Bayelsa State. 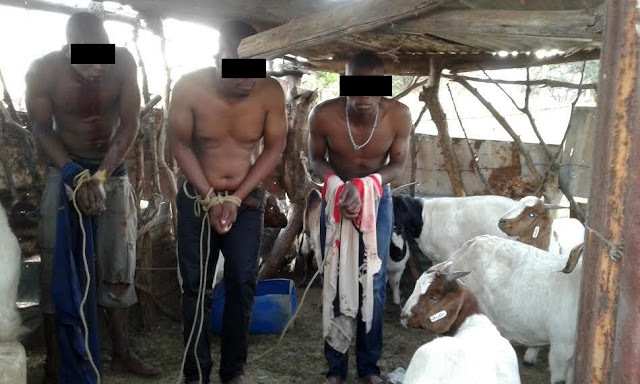 Vanguard gathered that ,the suspected thieves were caught while trying to escape with the stolen animals at an odd hour after they had successfully whisked out the two goats away from the animals’ barn. According to the eyewitness, when the suspects were accosted by a resident, one of the suspects, holding a Bible in hand, claimed they were Christians returning from a church service, but they could not explain how they came about the goats in their possession. The resident raised the alarm and alerted a local vigilante group, who later arrested and handed them over to the police. The owner of the goats has since collected her livestock from police custody.